Seven Summits provides a few weeks of summer day camp each year. We offer a safe environment with fun horse related activities running all day. Campers ride twice per day and spend most of their non riding time learning about the horses and spending time with their favourite equine. 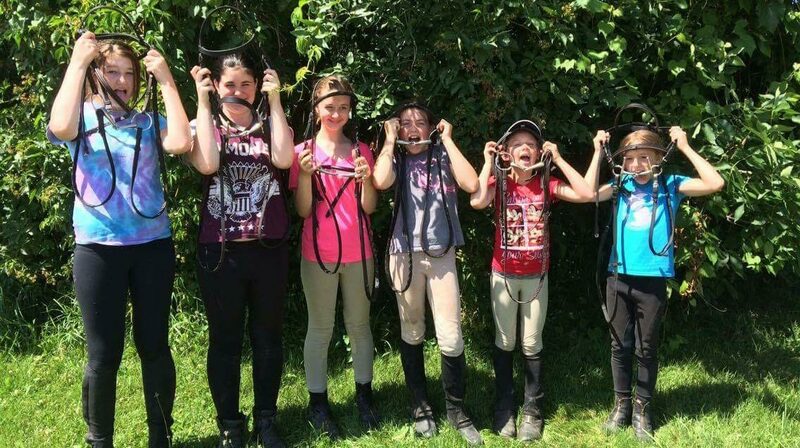 Seven Summits allows campers complete immersion in the horse environment all week long. Please ask about availability as our popular camps fill up quickly. These fun camps for ages 6-14 run 9-4 mon – fri. They must also have boots with a ¾” heel. Two riding sessions or one extended session. Students are assigned a horse for the week. They learn to care for this horse and will be able to ride this horse at the away show they can attend on Saturday. Trailering and coaching are included in the price however entry fees are not (approximately $50.00 per division). Students learn about proper preparation for a horse show on the Saturday, including extra grooming and a professional braider to teach proper braiding. Other activities include a visit from the vet and/or blacksmith, as well as learning to diagnose illness and lameness and how to treat them. Ask if we are hosting one this year. Kinder camp is another we occasionally run.